THE Republic of Singapore Navy will get a new chief next month, the Defence Ministry (Mindef) announced yesterday. Rear-Admiral (two-star) Lai Chung Han, 41, who is now deputy secretary of policy at Mindef, will replace Rear-Admiral (two-star) Ng Chee Peng, 44. The incoming rear-admiral, who is a President's and SAF Overseas Scholar, holds a Bachelor of Arts (Economics) from Cambridge University, and a Master in Public Administration from Harvard University. He has previously served as commanding officer of the RSS Valiant and 188 Squadron, as well as the navy's fleet commander, before becoming deputy secretary of policy at Mindef in September 2012. He received his first star at the age of 38 and was promoted to rear-admiral (two-star) on Tuesday. Mindef said in a statement that the change is part of the continuing process of leadership renewal in the Singapore Armed Forces (SAF). It thanked RADM Ng, who has held the navy chief post since March 2011, for his "dedicated service and sterling contributions". No details were given as to where he is headed. RADM Ng is credited with reorganising the navy's operational, training and safety systems. Under his charge, the navy has played a key role in international anti-piracy operations in the Gulf of Aden, Mindef said. He also set up the National Maritime Security System, which detects and responds to maritime threats. He also led the navy's community outreach efforts, such as Navy@Vivo, which allows members of the public to board and visit military vessels at VivoCity shopping mall. 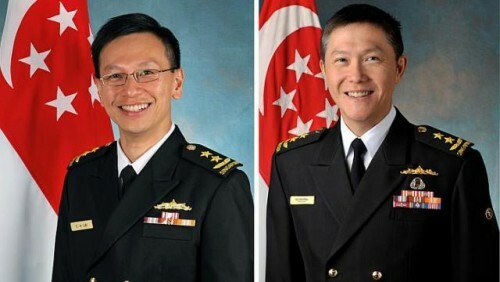 His elder brothers, Lieutenant-General Ng Chee Meng, 46, and Major-General (NS) Ng Chee Khern, 48, are the Chief of Defence Force and Permanent Secretary (Defence Development) at Mindef, respectively.